ArmadilloCon traditionally has a panel "What You Should Have Read This Year". The panelists are usually people who are closely familiar with science fiction, fantasy, or horror genres: most of them are book sellers (like Willie) or editors (like Diana Gill). In this panel they talk about new noteworthy books that they recommend to everybody who likes these genres. This year the panelists were Bill Crider, Willie Siros, Diana Gill, and Zane Melder. Looking for an idea? Watch our panelists brainstorm. What's the latest strange discovery? Our panel talks about the most recent results and odd topics they've seen. Looking for new ground in speculative fiction, art and science. 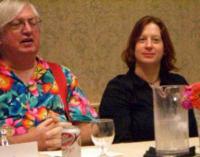 Here is an article about an older "Stump the Panel" at the ArmadilloCon 2006, featuring James P. Hogan's inimitable wit. Pictures from ArmadilloCon 2008 are available in my photo gallery. Synopsis, according to the ArmadilloCon program: You need a religious society for your work, but you have no idea where to begin and how complex you should make it. Should you have a couple of pages written down? Or should you make another book that describes the entire pantheon and religious rites? 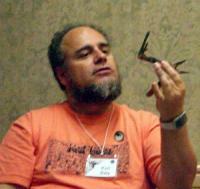 Pictures from Armadillocon 2004 are available in my photo gallery. Synopsis, according to the ArmadilloCon program: Myths as springboard for worlds and plot ideas in fantasy and science fiction. Mythic elements in science fiction. The Hero's Journey reconsidered. This panel explores myth as inspiration and diagnostic. My summary: How do the writers on the panel use myth in their own work? If a story is inspired by myth, is it necessarily predictable? Is that a bad thing, or is predictability exactly what SF readers want?... Do the limitations in our understanding of how the modern world works give rise to new myths? For example, does average person's erroneous understanding of how the Internet works morphs into a myth? Or does science leave no room for myth? What would it take for a myth to arise in our "rational" times? There was one other panelist that wasn't listed in the program. I think it may have been Mikal Trimm. The official summary "Our panelists pull out all their knowledge and create a world before your very eyes, with assistance from R. Cat Conrad on the white board." as it turned out, misrepresented the format of the panel. Mark Finn. I thought we were going to have to build a world. A panelist. No, no, make them work! So it was the audience that built the fantasy world, not the panelists. The latter provided feedback in a form of wisecracks (Mark Finn), by coaxing the audience to think through the issues involved in building a fantasy world (Gloria Oliver) and seek out plot devices that would turn the raw fantasy product into an actual story material (Caroline Spector). One thing the audience didn't need was to be prodded into activity. The topic was selected cleverly or fortuitously enough to send the audience's imagination into overdrive. If you want to know what story ideas and themes the audience came up with without reading their entire thought process, click here for the summary. Summary: The panelists are supposed to make up a science-fictional or a fantasy use for a random object. The objects are chosen by the audience. Some of them are a bit mysterious: their everyday function is not apparent. The program book said: "Want to hear about the best disasters in the fandom world?" Indeed, some of the fiascos, or merely weird stories, mentioned in this panel, were real pearls. 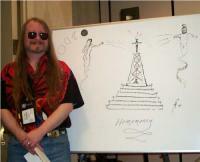 Pictures from ArmadilloCon 2007 can be found in my photo gallery. Since the stories told on this panel were somewhat personal in nature, the panelists' names were omitted. John Scalzi's interview took a different format than the usual Guest of Honor interview. There was no interviewer; Scalzi paced back and forth, shooting the breeze with the audience. He probably didn't say anything one wouldn't find on his blog. It's how he said those things that made him so entertaining. He acted out various stories from his life as little skits, from a Hugo winner's attitude to getting to know 16-year-old girls. He also commented on Neal Stephenson, openly admitted to stealing from other authors, and talked about why he could not afford to be as polemical in "Old Man's War" as Heinlein was in "Starship Troopers". Finally, he revealed an unexpected fact about himself. 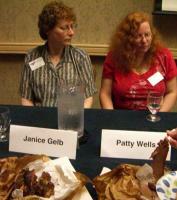 The pictures from ArmadilloCon 2008 can be found in my photo gallery.